You can quickly create a serial console connection to any Cisco device using a USB to serial adapter cable using the Mac Terminal app without any kind of special configuration. Using Mac Terminal app is the easiest way, since it avoids you downloading and installing 3rd party utilities which aren’t maintained as frequently for Mac OS X today. Some 3rd party utilities include zTerm and Cool Term. Follow the steps below to use Mac Terminal to connect to a Cisco appliance through serial console. Open Terminal in Applications -> Utilities. 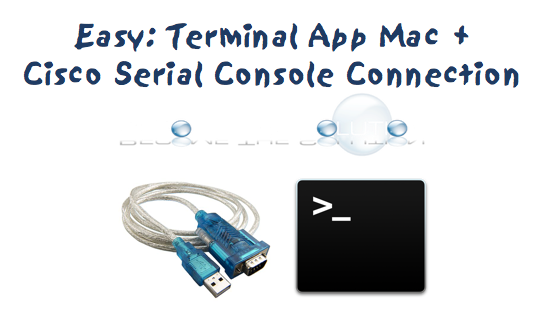 Determine your current serial ports on your Mac. Type the following command in Terminal. Note: Your serial connection will only appear if your USB to serial adapter is plugged into your USB port. Next, type the following command and replace with your serial connection you identified in the previous step. Your serial console connection will open in your Terminal window. You will be connected to your Cisco device and issue commands just as you would in Putty or SecureCRT. Yay!